Darklands is a world of war and brutality without end, the world of darkness we inherited - and one that you can help bring to life! 475 backers pledged £108,036 to help bring this project to life. Two days to go, and Darklands: Savage Hordes III needs YOU! Darklands: Savage Hordes needs YOU! Darklands: a World of War is Fulfilled! Seven Days to Go - Here's what YOU could fund! Over two weeks ago we launched a fantastic Kickstarter project - Darklands: Savage Hordes III - designed to fund mounted miniatures for all the various kindreds of Darklands, and we've been pretty successful so far because the project's initial goal has been smashed and we have loads of new stretch goals! Now we stand at around £33,000... but there's just two days to go until it finishes! GET A FREE MONSTROUS BEAST! Strictly limited to backers only! 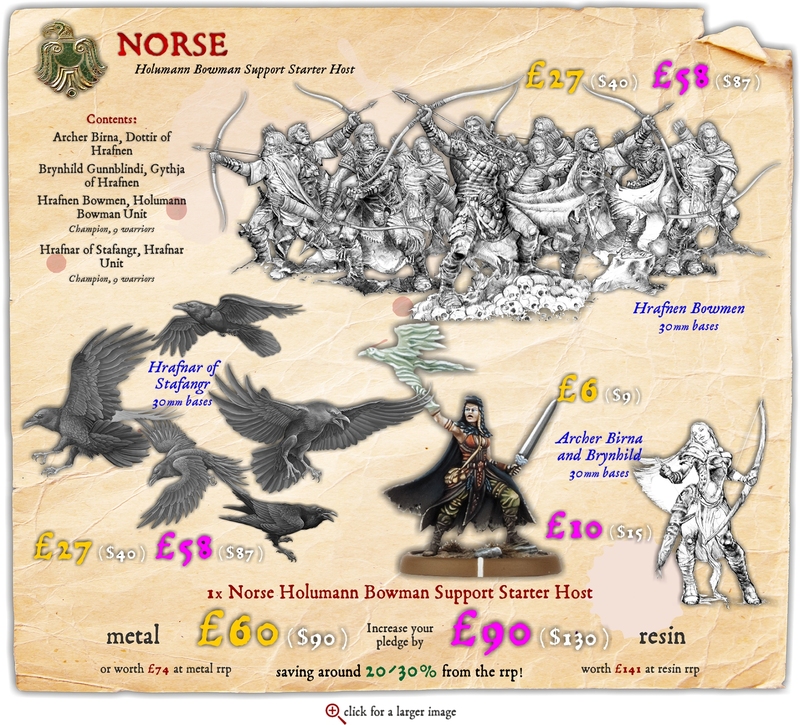 As well as providing you with a Mounted Starter Host in either metal or resin that includes a commander and ten mounted warriors for just £100 ($130) in metal or £140 ($180) in resin (saving you around 25% from the eventual RRP! ), we're also giving you the opportunity to get a hold of a FREE monstrous beast if you purchase the sell-sword Beast-Master on Swift-Horse, Alix! Click for the Alix update! Backing Darklands: Savage Hordes III is a great opportunity to get into the dark fantasy world of Darklands for the first time, to expand your existing Darklands collection or maybe just to grab some fantastic miniatures to paint. We'll give you the option to purchase everything in resin, too, if you're more of a painter than a gamer! The stretch goals still to go for in this project are outlined below - remember, we've unlocked everything up to £33,000 so far! Plenty - to have a good look, here's the full stretch goals map. Anything in white, you can pledge for now as they're unlocked! There will be more mounted warriors and other cool things - unveiled by Stretch Goals - as the project continues! 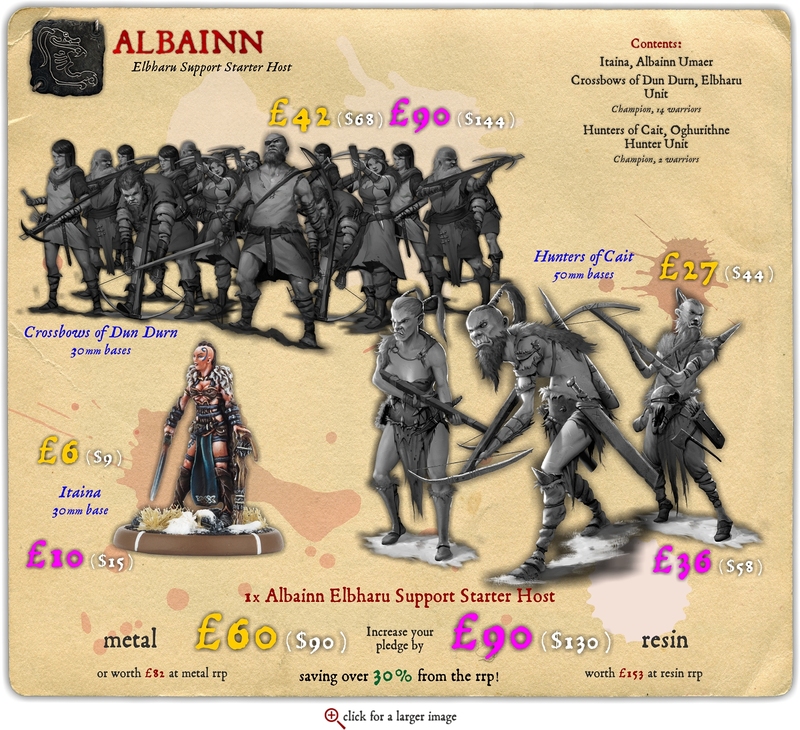 "I JUST WANT SOME COOL MINIATURES": £10 initial pledge - for those who want a few single miniatures or other bits from the project. 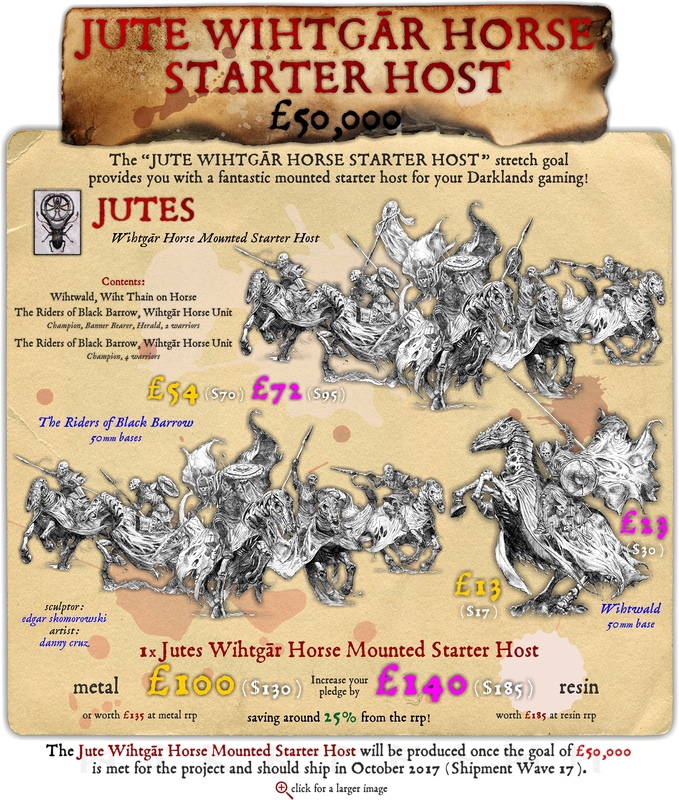 "METAL MOUNTED HOST": £100 ($130) initial pledge - a mounted host such as the Reiver Horse, worth £135 at RRP! 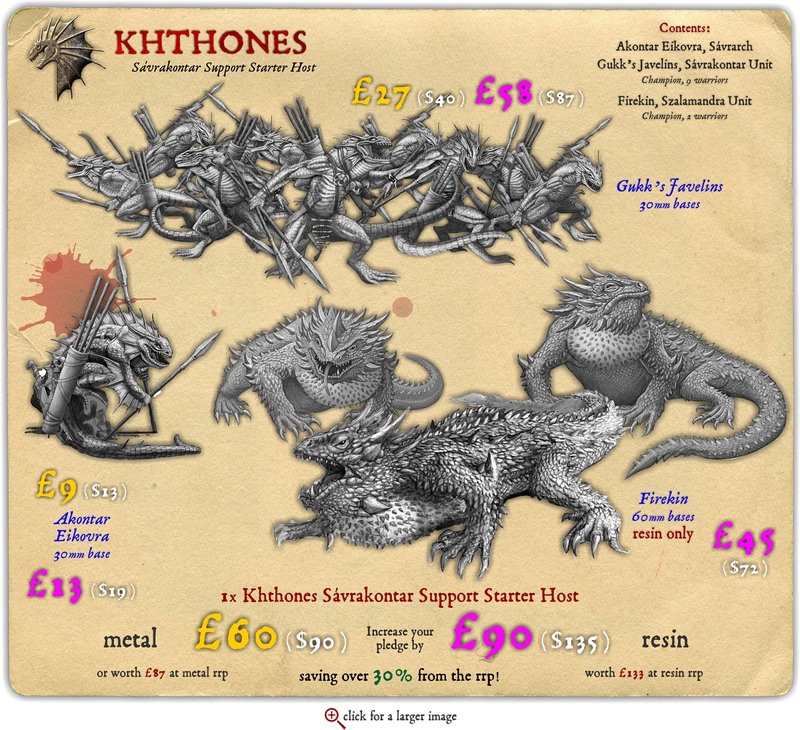 "RESIN MOUNTED HOST": £140 ($180) initial pledge - a mounted host such as the Oghureach, worth £185 at RRP! 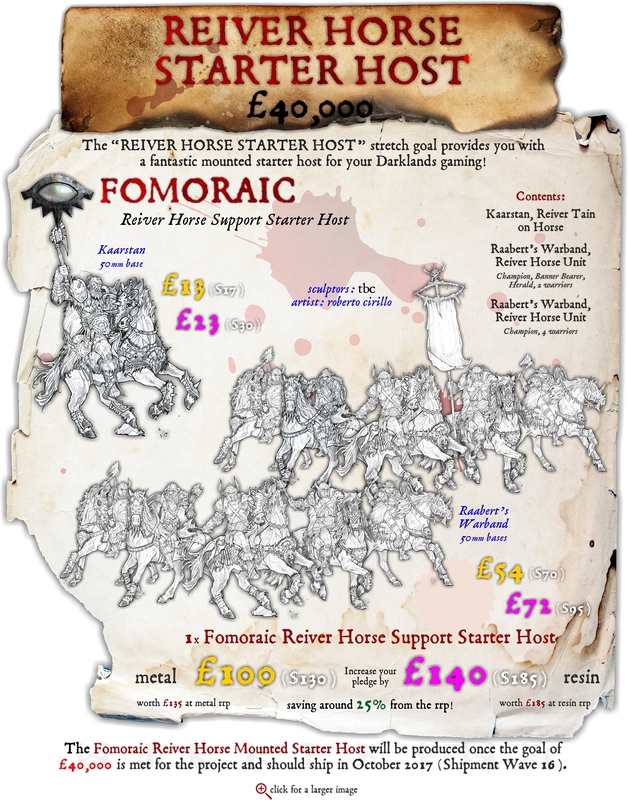 "ALL THE INITIAL METAL HOSTS": £450 ($585) initial pledge - get all the initial hosts (the Duguth Ēored, Oghureach [resin only], Horse-Ax-Drune, Reiver Horse and Wihtgār Horse) at almost a 50% discount! THIS REWARD IS STRICTLY LIMITED TO BACKERS ONLY - it will not be available post-project. 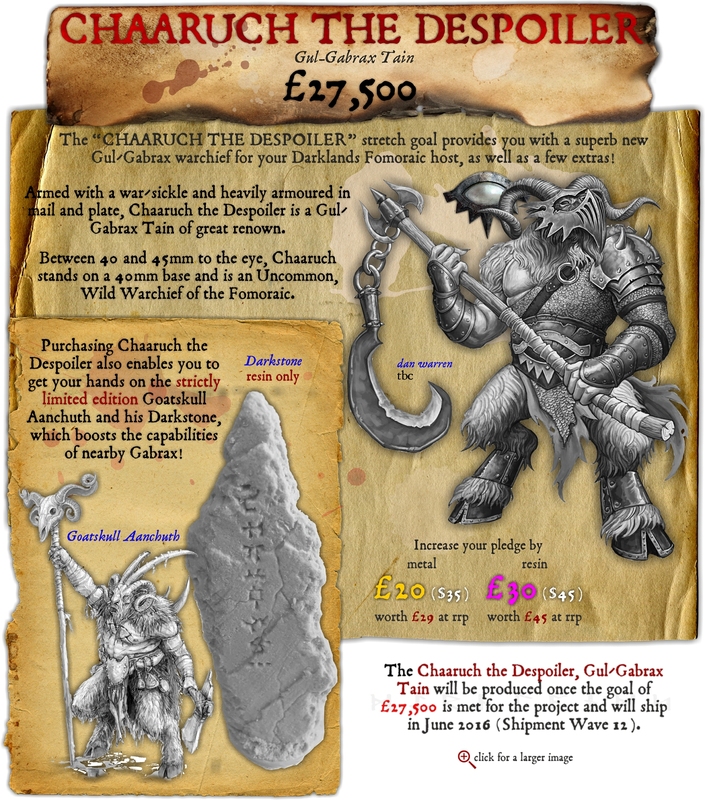 "ALL THE INITIAL RESIN HOSTS": £650 ($845) initial pledge - get all the initial hosts (the Duguth Ēored, Oghureach, Horse-Ax-Drune, Reiver Horse and Wihtgār Horse) at almost a 50% discount! THIS REWARD IS STRICTLY LIMITED TO BACKERS ONLY - it will not be available post-project. There's plenty more to it than that, but that's a simple overview of what you can go for! 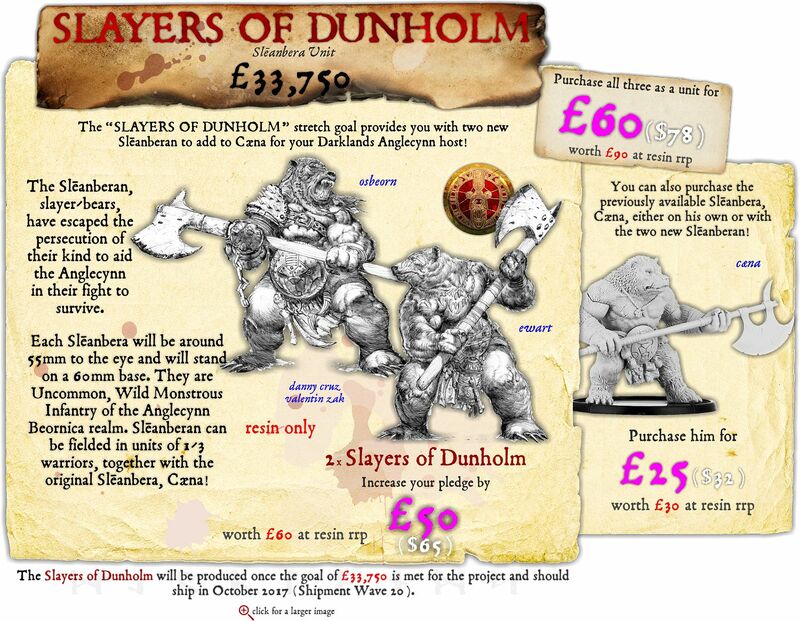 Head on over to Darklands: Savage Hordes III and see what you can help to fund! 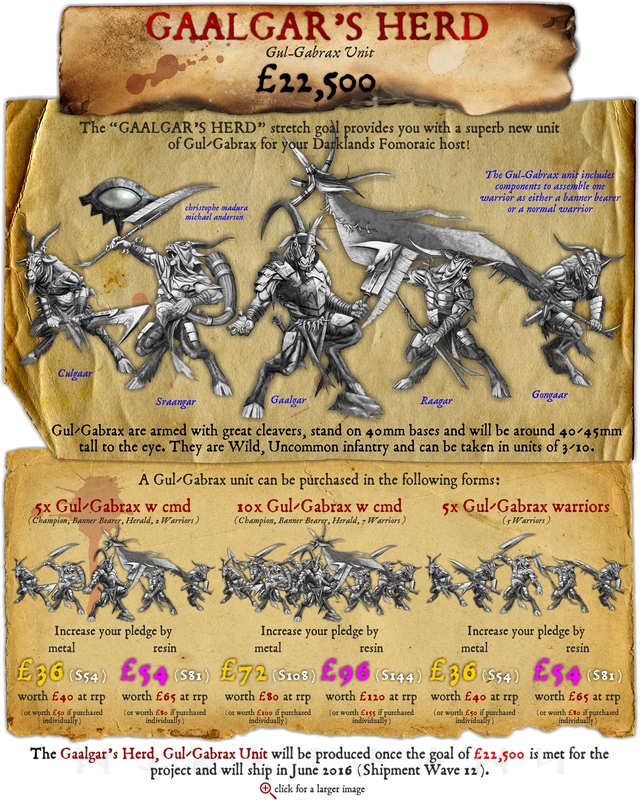 A week or so ago we launched a fantastic Kickstarter project - Darklands: Savage Hordes - to fund miniatures armed with ranged weapons for all of the various kindreds of Darklands, along with the Savage Hordes muster book. Now, as well as providing you with a Support Starter Host in either metal or resin that includes a commander, infantry support unit and a monstrous infantry support unit for just £60 ($90) in metal or £90 ($130) in resin (saving you over 30% from the eventual RRP! ), we're also giving you the opportunity to get a hold of these amazing Infantry Hosts which, with a Support Host or another Infantry Host, will boost your host to at least 1,000 gold! Led by a commander that's not yet been produced in metal, each Infantry Host features a unit of infantry (usually ten strong, with full command) and a monstrous beast to batter your enemies to death with. We've thought long and hard about what's in each infantry host, and they'll compliment your Support Hosts extremely well. Suffice to say, if you have an Infantry Host and a Support Host for the same kindred, you'll have a host of at least 1,000 gold ready and able to take on the enemy! 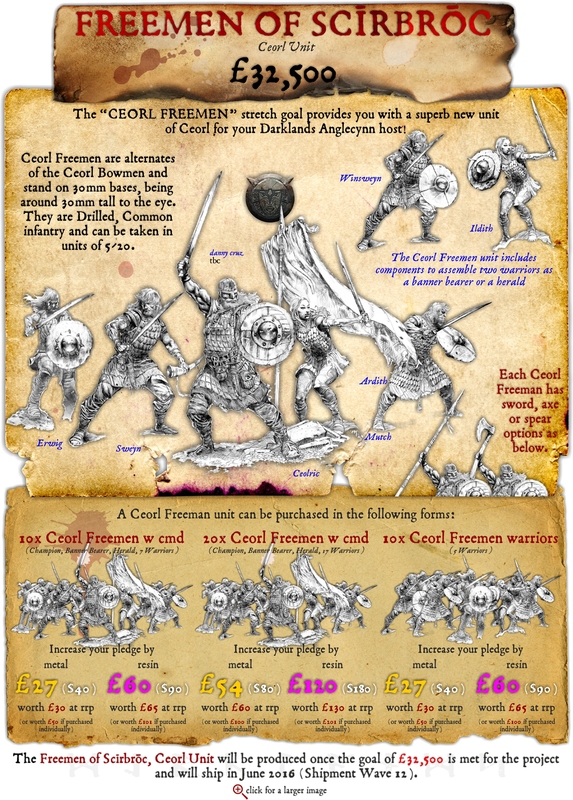 Increase your pledge by £60 to purchase an Infantry Host in metal (although the monster will always be resin), or £90 to purchase the Infantry Host in resin. As well as the new Infantry Hosts, we're also giving you the opportunity to get a hold of these superb, strictly limited edition Sell-Swords! Produced in metal only and presented to you in a numbered Mierce Miniatures blister pack, each Sell-Sword is limited to 50 casts only on a first come, first served basis. You are also limited to a maximum of 2 each per backer - one to use, one to keep! 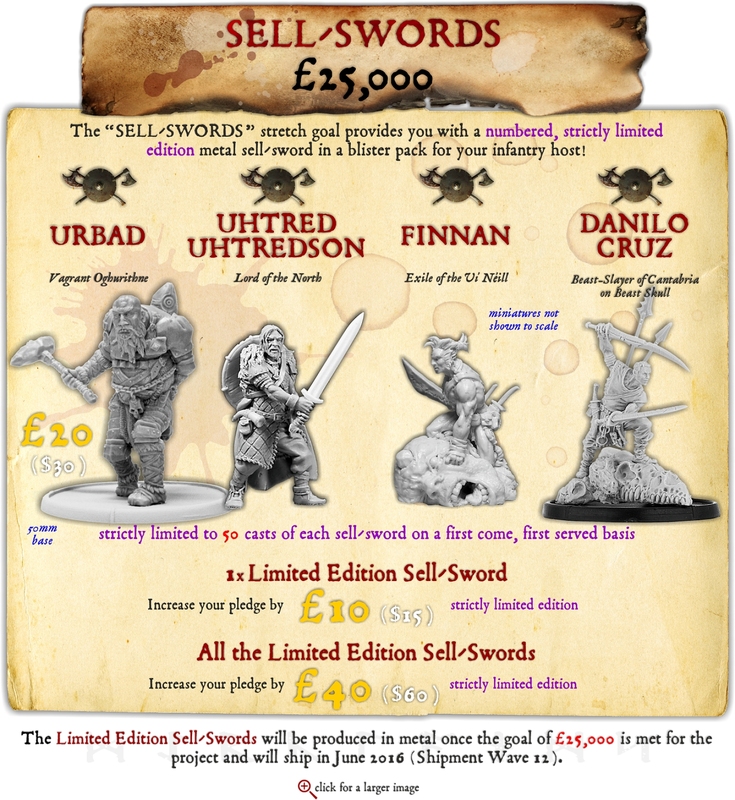 So that we know how many are left on this project, we ask everyone who increases their pledge by £10 (or multiple of £10, or £20 for Urbad) - and who intends to purchase a sell-sword with that increase - to send an e-mail to us at kickstarter@mierce-miniatures.com and let us know how many of each sell-sword are to be purchased. The sell-swords won't be available to purchase on the webstore - we'll simply remove the Moneyback from your eventual pledge total and create an order for you with your sell-swords. We'll keep you updated on the comments section of the project as to how many of each have been sold every day, and even every minute if stocks get low... but we can tell you what the totals are right now of course! As you can see, you'd better get pledging for them now - because once they're gone, they're gone forever! Backing Darklands: Savage Hordes is a great opportunity to get into the dark fantasy world of Darklands for the first time, to expand your existing Darklands collection or maybe just to grab some fantastic miniatures to paint. We'll give you the option to purchase everything in resin, too, if you're more of a painter than a gamer! Darklands: Savage Hordes ends on Tuesday the 13th of October, which means you've around six days to get a pledge in! Support Hosts contain a small Darklands host of around 499 gold - so Encounter Host size - where possible, and you can add the rulebook, order tokens and D10 dice to your pledge to ensure you have everything you need to get started! The Support Hosts currently available to go for are outlined below. There will be more Support hosts as the project continues! There's also a couple of amazing units to go for, too! There will be more Stretch Goals as the project continues! "SAVAGE HORDES MUSTER BOOK": £30 initial pledge - the Savage Hordes muster book for Darklands, compiling all of the currently available kindred musters into one volume! 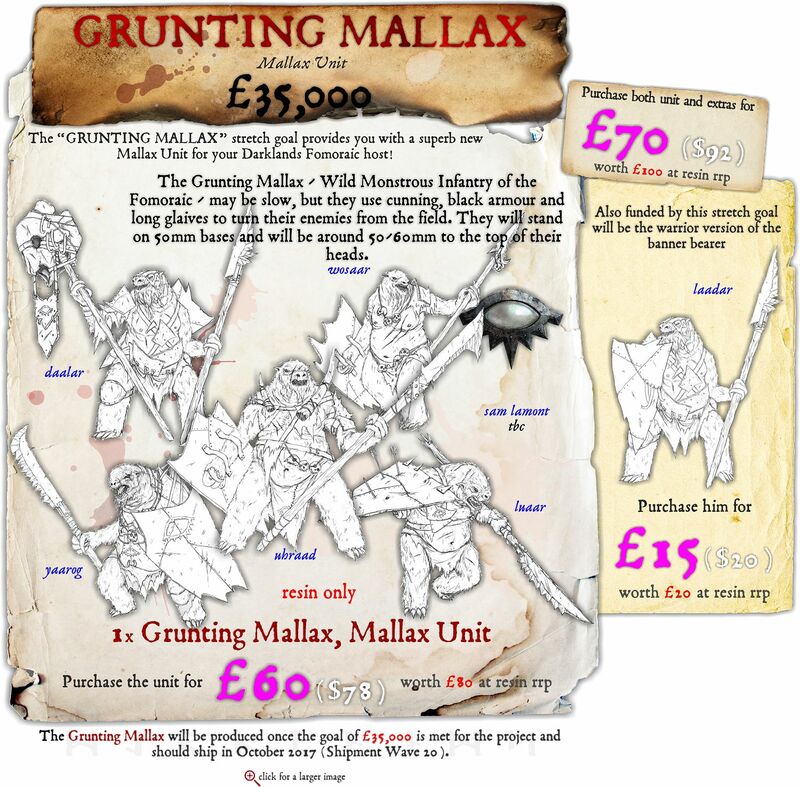 "METAL SUPPORT STARTER HOST": £60 initial pledge - a 500 gold encounter host of ranged warriors in metal to get you started with Darklands! 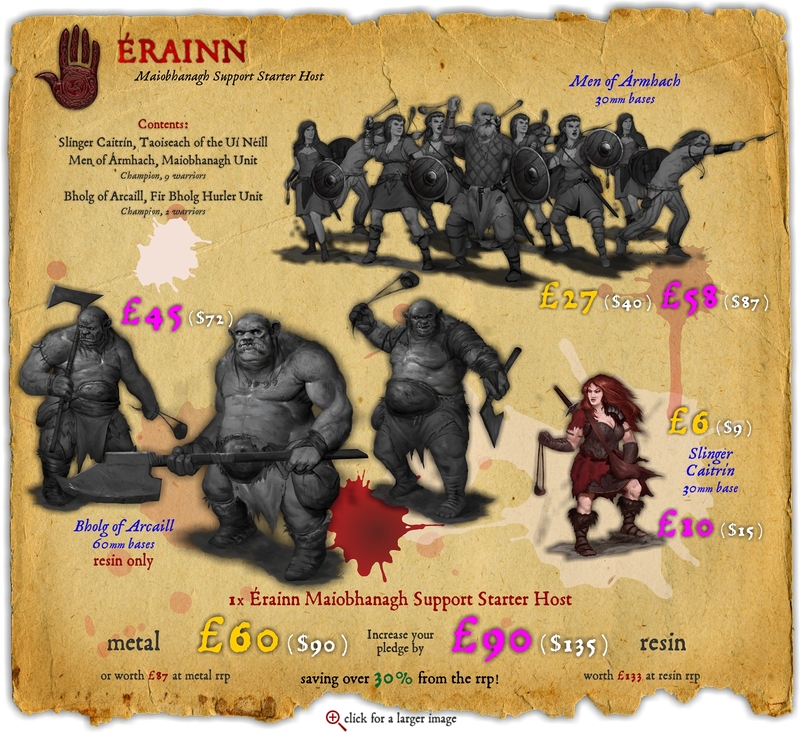 "RESIN SUPPORT STARTER HOST": £60 initial pledge - a 500 gold encounter host of ranged warriors in resin to get you started with Darklands! "ANY TWO METAL HOSTS": £110 initial pledge - this reward provides you with two Support hosts of your choice in metal, for you and a friend - or maybe just for yourself! 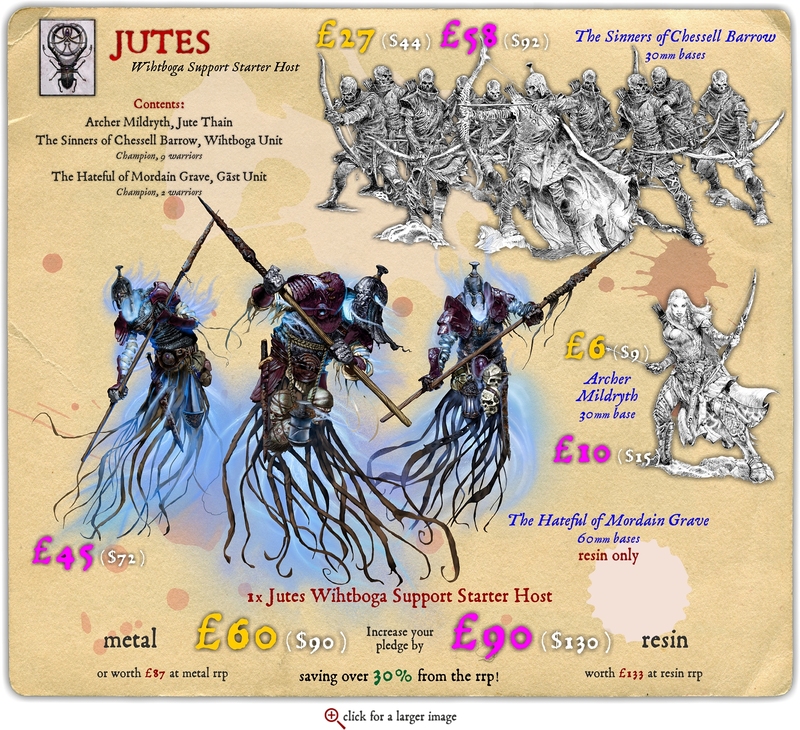 "SAVAGE HORDES MUSTER BOOK AND ANY TWO METAL HOSTS": £110 initial pledge - this reward provides you with the Savage Hordes muster book and two Support hosts of your choice in metal, for you and a friend - or maybe just for yourself! "ANY TWO RESIN HOSTS": £170 initial pledge - this reward provides you with two Support hosts of your choice in resin, for you and a friend - or maybe just for yourself! 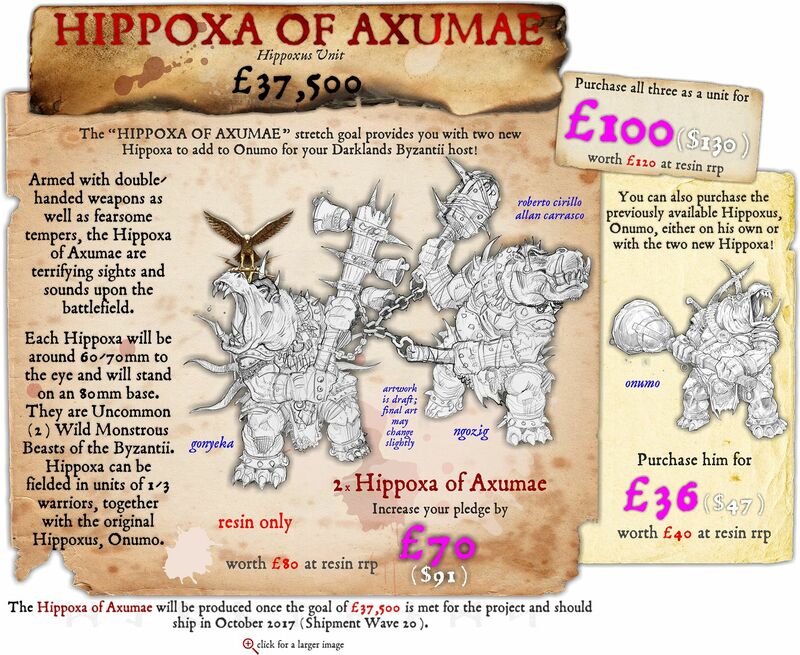 "SAVAGE HORDES MUSTER BOOK AND ANY TWO RESIN HOSTS": £200 initial pledge - this reward provides you with the Savage Hordes muster book and two Support hosts of your choice in resin, for you and a friend - or maybe just for yourself! 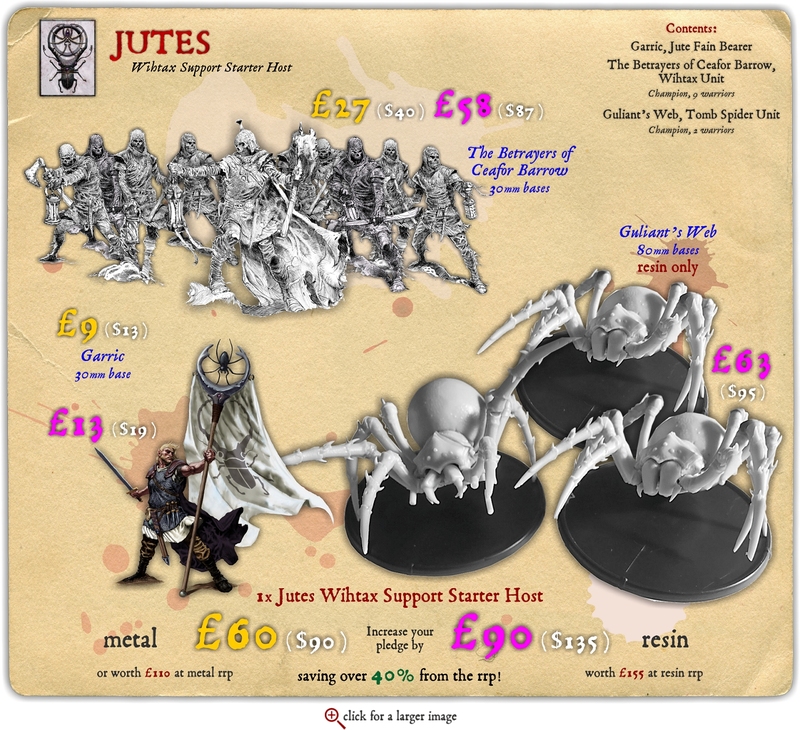 Not only do you get to fund some fantastic metal miniatures - and around 30% cheaper than their eventual RRP - you also get more! Now those are fantastic deals! 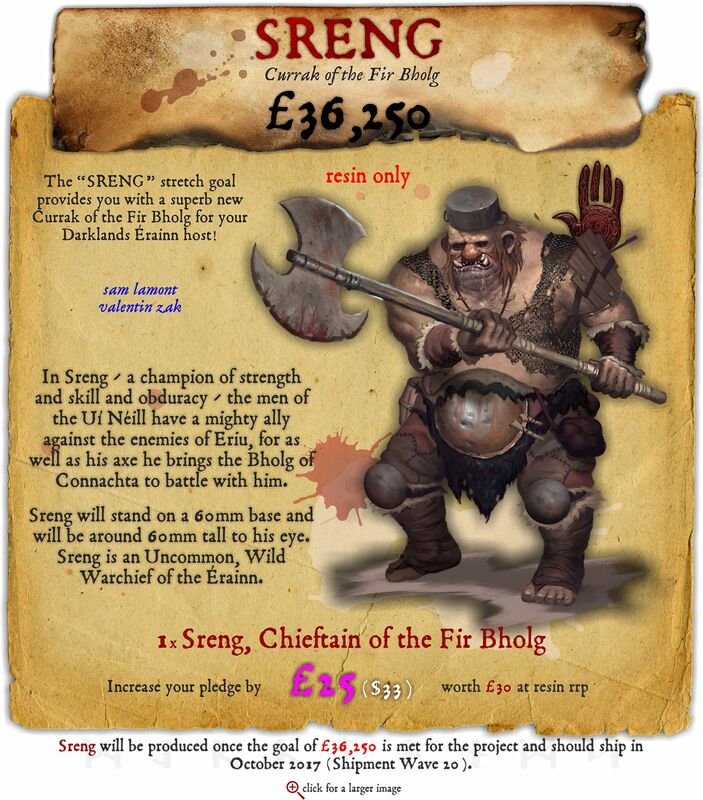 Head on over to Darklands: Savage Hordes and see what you can help to fund! As we've said before, Darklands: a World of War is now totally fulfilled - but we've still got stuff to show you from this project, not the least of which are painted miniatures and the latest kindred musters. We also have something special for you this week - the very first Darklands cosplayer! anything else you can expect from us over the next few months. We're slowly painting up all of the miniatures from Darklands: a World of War, and whilst we're prioritising painting the new releases to come from Darklands: First Edition we can still get a few done from here over time. Thus, both Sébastien Picque and Martin Grandbarbe are hard at work, painting miniatures from this project, although we only have something from Martin to show this week...! Carrowek of Carn Dhu, War-Drune on Drune-Horse was the first miniature sculpted for this project, if our memory serves us correctly, so it's been a good long wait to see him painted by ourselves. Sébastien Picque has certainly pulled him off in style though! There's still plenty of miniatures yet to be painted from this project, so keep your eyes peeled for those in the future! It had to happen eventually... and we are very thankful that it did! The very first Darklands cosplayer is here! A long time backer, Richard from France, sent us this image of Jennifer who, we're sure you'll all agree, bears a striking resemblance to our lovely lady Leofwen of Dēra. We particularly like the Great Hart's ears, they are so life-like, but her banner and sword are also excellently imagined! We do hope that this starts a spate of Darklands cosplaying... send your pictures in folks! Darklands: a World of War is now completely fulfilled! All of the QuickStarter Rulebooks have now been shipped, as have all the miniatures; and we do hope that this project has, at the very least, met your expectations, if not blown you away with the quality of our miniatures, customer service and the rules themselves of course. None of the awesome miniatures we have produced (nor the QuickStarter Rules) could have existed without you guys, all of you that backed this project in early 2013. So it has to be said - THANK YOU- to each and every one of you, because without you, it's very doubtful Darklands and Mierce Miniatures would be where we are today. That's why you're mentioned on the inside back cover of the Darklands QuickStarter Rulebook if you backed this project, so look out for that when you get your copy! I don't have a QuickStarter Rulebook! I want one! How do I get it? 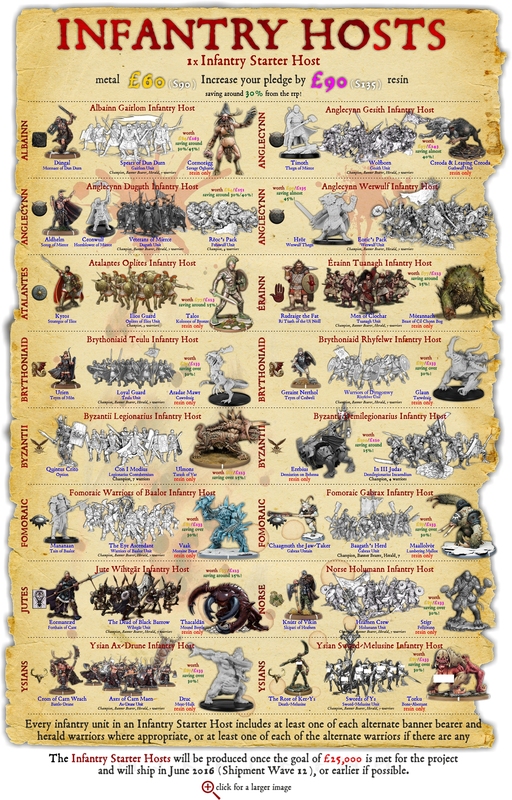 If you want to get your hands on an awesome copy of the printed QuickStarter Rules, just pop on to the Mierce Miniatures website and order one. You can of course download a printable version, but printed rules are never the same. If you're interested in Darklands, get a copy! I've not received my QuickStarter Rulebook! Help! If you feel your order hasn't been fulfilled in some way, please contact us and we'll sort everything out for you! This is particularly true for those backers who have moved, for we have had a few QuickStarter Rulebooks returned. We've messaged them, of course, but life moves on and it may be that those messages are not getting through. Either way, just contact us and we'll sort it! What happens with this project now? As long as Kickstarter lives this project will serve to inform everybody about what this project did and what was produced, of course, but even though there's nothing left to fulfil, we'll still update this project now and again with images of painted miniatures from this project, or perhaps news about Mierce Miniatures and upcoming projects. So there'll still be a reason to visit! Darklands is a tabletop skirmish wargame in which you command the hosts of man and beast that your ancestors once did for glory, power or simple survival! To play Darklands with our fantastic range of miniatures, you need rules of course - and whilst the full Darklands: First Edition rulebook is not yet available until later on in 2014, you can still play the game with our Darklands QuickStarter Rules, which you can download right here or purchase from the webstore! As well as the QuickStarter Rules, you'll also need the Muster Rules (which show you how to build a host) and the various Kindred Musters (which give you all the warrior profiles for every single miniature we have produced or will produce). The Darklands QuickStarter Rules are a simplified version of the forthcoming Darklands: First Edition rules that will allow the keen wargamer to play a very basic version of Darklands easily and long before the full rules are released. As such, wargamers must understand that - whilst the basic procedures of how to play Darklands are presented here (such as how to move your units and fight with them, as well as shoot the enemy and invoke sorcery) there will be much more to those procedures within the full rules as well as much else besides. Until the creation of the Darklands: First Edition Rules, the QuickStarter Rules will always be "living" rules - i.e., they will be updated when necessary and always available for download. The current PDF version of the Darklands QuickStarter Rules - v10.6 can be downloaded by clicking on the link below. Purchase the printed QuickStarter Rules! The http://www.mierce-miniatures.com/index.php?act=pro&pre=mrm_dkl_bok_rul_001_qst_pbk" target="_blank">QuickStarter Rulebook has been lovingly printed in A5 format which you can purchase from our website! We now have a low-res version of the Darklands QuickStarter Rules for you to download and peruse (and maybe even print) at your leisure. We must warn you, though - it's a very large file, over 280Mb! Something to download overnight, we think. Don't forget, you can still purchase the Darklands QuickStarter Rules from our webstore! To play a game of Darklands, a player must choose a kindred or realm they like and a general from its muster. Then an opponent with a host must be found and a battle size agreed upon. Both players then spend their gold wisely to muster their host and ultimately meet upon the battlefield! The Darklands Muster Rules govern how you build a host for Darklands from the various Kindred Musters and will always be "living" rules - i.e., they will be updated when necessary and always available for download. The updated PDF version of the Darklands Muster Rules - v2.4 can be downloaded by clicking on the link below. These Muster Rules also include the most recent, updated rules regarding hosts, units and warriors as listed in the QuickStarter Rules. A Kindred Muster, what we call an army list, gives you the blocks to build a host of a particular kindred or realm for Darklands. It includes all of the different unit types available to you as a general wishing to create an army, in the shape of warrior profiles. The kindred musters given below include most (if not all) of the warriors unlocked by our projects so you can check exactly what you're getting for your money in game terms. Again, the Kindred Musters will always be "living" rules - i.e., they will be updated when necessary and always available for download. Bear in mind, however, that any new profiles are only partially playtested (if at all) - expect changes and feel free to give us feedback on the Mierce forums. Check them out for some awesome new warriors, however! Musters in BOLD CAPITALS have been updated on the date stated above. we have increased the attack dice of quite a lot of warriors, but of note are the infantry; we felt that they were not doing enough for their gold, so we increased the attack dice of a standard human infantry warrior to 3, those with a great weapon 2 and those with two weapons 4. This has sometimes increased the gold cost of the more powerful infantry warriors, but not always. Some monstrous infantry have also changed, usually an increase of 1 attack die. Warlords and warchiefs follow on from there. We promise to get the Sell-Swords muster sorted as soon as possible... honest. There'll be more Kindred Muster updates soon! No doubt there'll be a few errors or typos - feel free to tell us about them on our forums. That's what many of you already do, and it helps Darklands greatly! Upon each profile is a handy pronunciation guide (based on the Wikipedia Pronunciation Respelling Key) under the warrior's title and, at the bottom of each profile, a suggestion on which miniature from our range to use as that warrior on the battlefield. That's it for this week guys and gals - check back some other time for more Mierceday action on here! With our latest amazing Kickstarter project - Darklands: New Kindreds - just finished this Monday just gone, it's time to turn our attention back to this, our very first Kickstarter project - and we have excellent (if a little sad) news for you all... because Darklands: a World of War is now totally fulfilled! So let's go into a little more detail about the project's fulfilment, and show you some lovely painted miniatures too among other things. The Angelcynn Wælwulf Thegn Cearl is a lovely miniature, sculpted by Benoît Cosse from artwork by Christophe Madura. He has turned out brilliant in our eyes - Martin Grandbarbe is a master at skin colours and Cearl really shows this off! Well, that's it, everyone. It is both an excellent day and a sad day; Darklands: a World of War is now completely fulfilled! to each and every one of you, because without you, it's very doubtful Darklands and Mierce Miniatures would be where we are today. That's why you're mentioned on the inside back cover of the Darklands QuickStarter Rulebook, so look out for that when you get your copy! The QuickStarter Rulebook has been lovingly printed in A5 format which you can purchase from our website! Musters in BOLD CAPITALS have been updated on the 17th of October. Thanks to Sven Godenrath and Eric Nielsen for many of the updates above. Our fantastic Darklands: New Kindreds project continues apace and it's time to round everything up that's happened over the past week! We've smashed through a few stretch goals over the past week, but there's still plenty to go at. Here's what's currently up for grabs! More Monstrous Infantry Starter Hosts! Many of these are unlocked at £85,000, so they're not too far away - and if you pledge for these now, it's more likely that we'll get to the later ones! You can get the fantastic Danilo Cruz on Horse and Sáthach on Horse for FREE by pledging £220, £280 or £500+, or purchasing certain rewards! As you can see, both Danilo Cruz and Sáthach on Horse are freebies after you've pledged a certain amount - and regardless of your reward. Note that you don't need to do anything in the pledge management phase to get either for free individually; we'll simply add them to your orders as necessary. If you have a choice of either Sáthach on Horse or Danilo Cruz on Horse, just give us a special instructions note on the order you make when managing your pledge. You can, of course, get either Sáthach on Horse or Danilo Cruz on Horse by choosing a certain reward. Again, you don't need to do anything here - we'll add them to your orders ourselves. Sneak Peeks - this is what you could be funding for the Other Kindreds soon! There's one thing we do on the comments section that always gets people excited. We show sneak peeks of concept art that could appear as stretch goals later on in the project! Take a look at what you could be funding soon! Murcunn, Oghureach Uhmaer - Murcunn could be our first Oghureach, or Ogre-Centaur! He's an Oghureach commander and will stand on an 80mm base, being around 70-80mm to the eye. He will be a Wild Warchief with an Ubiquity of Rare. NEW! Ettu, Revered Goghu - the very first of the Goghu, a warrior of stone for the Albainn. He'll stand on an 80mm base and be around 50-60mm to the eye. Youths of Mierce, Geoguth Unit - Geoguth are, literally, "young warriors" and are professional - if rather headstrong and inexperienced - warriors in Angelcynn hosts. Armed with spear, shield and leather armour, Geoguth are Common, Drilled infantry and stand on 30mm bases, being 30mm tall to the eye. NEW! 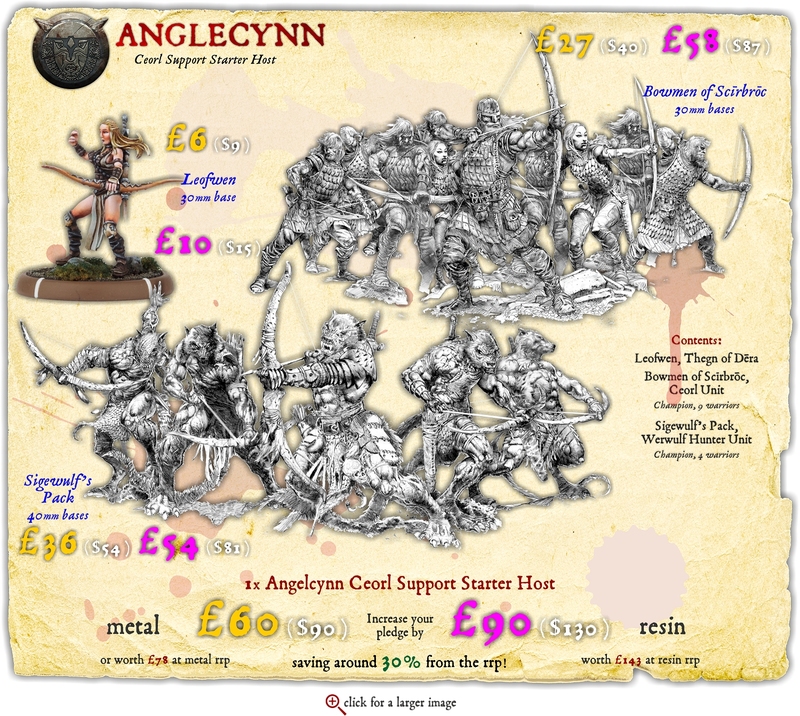 Sweorcan's Pack, Wulf Unit - a unit of Wulfas for the Angelcynn, destined to join your Wild Hunt... they'll be on 30mm bases and will be Common, Wild Beasts. Grachdu, Tâncawrdraig - a mighty Cawrdraig or ogre-dragon for the Brythoniaid! Grachdu is a banner bearer, a fire-ogre-dragon, although there will be an option on the sculpt to turn him into a warrior. NEW! Bronn ap Banbronn, Cocwocor - a mighty Cocwocor of Powys, standing on an 80mm base! NEW! Iqqud, Dromedon - a bigger camel-man to fulfil the beast in you, this guy will be on an 80mm base... the Dromedii on 50mm bases, so he'll be a big 'un! Maatmäg, Gigantic Mammox - a mighty Mammoth to trample all over your foes. 120mm base. Gaanh, Walvax Gultain - the champion of the monstrous infantry Walvax Unit. 60mm base. NEW! Aggrakk, Brutal Krokokh - another cracking lesser beast, this time for the Khthones, and he'll stand on an 80mm base. Belly's gonna getcha! Kliss, Sávrar Ikon Carrier - the banner bearer of the possibly forthcoming Sávrar Unit! 40mm base. Hammer-Druc - a mighty beast for the Ysians, an alternate of the original Druc. 100mm base. Conjunct XIX may well appear later on in the project... depending on how far we get! There'll no doubt be more never-before-seen concept art over the course of the project, too! 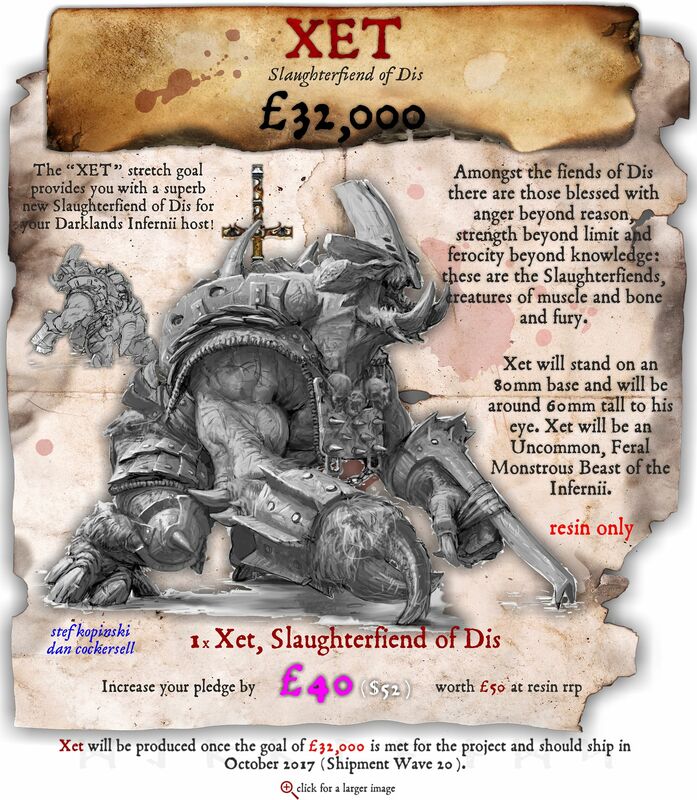 The amazing Zedmeister (who in real life is called Zenas), a backer of all of our projects, has perpetrated another fantastic Pledge Calculator for Darklands: New Kindreds. Click on the image to visit Zed's Pledge Calculator! Zed's Pledge Calculator helps you work out exactly what you can get for your money - we urge you to check it out! Bear in mind that it's a work in progress, and will change when there's something to add! Here's something awesome - a fan-founded Facebook page for Mierceites, called Mierce Militia! Click on the image for visit the Mierce Militia Facebook page! Get yourself on Facebook and have a look!